In less than a week, yours truly, Goatman, will step back onto the Appalachian Trail to finish the last 969 miles of a thru-hike that began in 2013 with a 1200+ mile trek. The time for planning, prepping, training, and ruminating is over. And good riddance. I know this may come as no surprise to many of you that know me, but you may as well stamp “Type B Personality” on my forehead. Making lists upon lists, worrying about details, lusting after improvement: not my style. Luckily for me, the AT isn’t an expedition. Nor is it a race, or a chore, or a job. And that’s what makes it so great. The AT is an adventure. Look that up in the dictionary. Having read the other installments of the Return of the SLOBO series, you may think I really have everything together. Surely, a man conceited enough to presume to tell you how go on a very personal, very emotional adventure should himself be a shining example of the Fully Prepared Backpacker. Welcome to reality: I have no idea what is coming. Having hiked long-distance before, I know only one thing to be true: the trail teaches what needs knowing and nothing but putting feet to dirt is going to help you in the end. Disconcerting? For some, I suppose. We are raised with the idea in mind that knowledge is inherently important to a task. I would argue that wisdom trumps knowledge a majority of the time. Knowing that you have 17.8 miles until you camp for the night and that water is 5.2 into the hike tells you very little about how your day is going to go. The elevation charts in the guide books are convenient fantasies and often misleading. It never rains for days on paper. Am I saying to throw the guidebook off a cliff, sell your bag to a bear, and head off into the Great Unknown with only your cunning and sturdy stick to keep you safe? Or course not (okay, sometimes I get in a mood and say exactly that, but don’t listen to me all of the time. It’s bad for you.) I still stand by everything I said in the early articles concerning physical and mental training, buying gear that keeps your safe, happy, and moving, etc. All good ideas. Unfortunately, they are only that. Ideas. So you read the articles with good intentions in your heart, but now it’s go time and you didn’t hike as much as you wanted before setting out, your legs aren’t in the best shape they could be, you took some last minute things and now your pack is heavier than you wanted, and your mind is scattered and racing worrying about all of the “What Ifs”. Now what? Do you cancel your plans? Do you say, “Maybe next year”? Do you justify an existence in which your dreams are not manifested into reality? You hit the trail. And you hike. And you get stronger and smarter and more wise everyday. 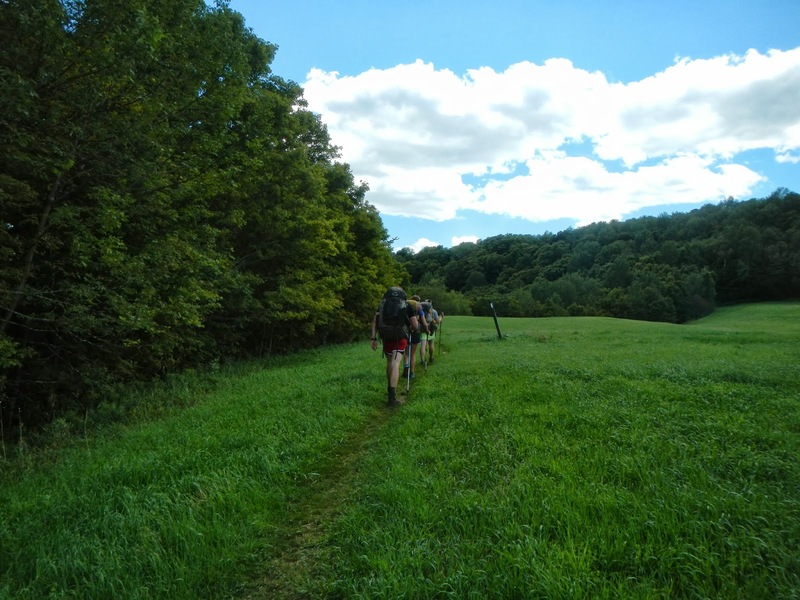 Suddenly, you’re hiking the AT and you’ve done a week and you’re still scared, more tired than you’ve ever been, and still not so sure you’re ready for all of this. And then you hike for another week and realize that you are as strong as you want to be, that exhaustion is uplifting if related to a purpose, and that no one is ready for this! And then you hike for another week. Excuses make terrible hiking partners. In the end, trails are for hiking, not analyzing. I cannot wait to shut my silly mouth, strap up, and go. The next time you hear from me, I’ll have some good stories for you, I’m sure, and I’ll be sharing some here if I can. Previous More Return of the SLOBO? Oh! The dreaded gear installment! One would think that, after hiking thousands of miles, working at an outfitter, and keeping up with innovations in the backpacking industry, old Goatman would just be waiting to tell you everything he knows about the gear you should take on a thru-hike of the Appalachian Trail. The problem is this: I am not you. I’m not packing for you, I’m not resupplying with you, I’m not throwing your bag on my back, and I’m not hiking a single mile of the trail for you. 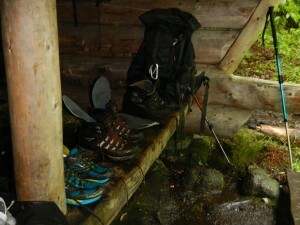 The gear I use is simply that: it’s what I use while on the trail. I could type up a spreadsheet with weight and cost and every other variable listed out, post it here, and be done with this article, but all you would know is what I take on a hike and not what you, dear reader, should take on a hike. Again, I am not you. I don’t have your feet, I don’t worry about your fears, and I happen to be as strong as one donkey and one mule combined in man form, thus rendering the weight concerns of your average human meaningless to me. You may be asking yourself: “Well, Goatman, what exactly are you going to talk about in this article besides being a mutant-hybrid pack creature?” Good question. Let’s get to the meat of it. Despite current fashion or gear trends, the gear you take on the AT should do the following things for you: keep you safe, keep you happy, and keep you moving. Seems pretty simple. I don’t wear a rain shell when the skies are blue just to look cool. I wear it when it is raining to keep dry and warm. I might wear it above treeline to keep the sun and wind off, but otherwise, it is sitting in my pack, waiting for the weather to turn nasty. I don’t put it in a bounce box just because it looks like a nice couple of days ahead. It is not useless weight just because I carry it as much as I wear it; it is still serving its function as a piece of bad weather gear when tucked away. Try and check the weather predictions along the entire AT for a six month period. Nonsense, right? You don’t pack for the perfect days. You pack with the hard days in mind and you pack to lessen the effect that hard days will have on you, whenever they come. This can be extended to almost anything in your bag: a headlamp is only useful in the dark, but get caught without one on an overcast night when you get stuck out late on the bogs and see if you don’t wish you had one. Before leaving something at home, ask yourself, “Am I sacrificing safety by not having this with me?” If you are fine with the risk imposed, then by all means, get it out of your pack. There are things that work as a safety blanket more than they work as functional gear. You will learn the difference on the trail if not before. Something we tend to emphasize that bears repeating: do not set foot on your thru-hike with gear that you have never hiked with before. Think you need a 7 inch bear hunting knife for safety? Well, take it out on a weekend trip and see how many times you actually need it. Guess what? People have hiked the AT with less useful things and made it every step of the way. Were they being stubborn? Undoubtedly. Could they have lightened their load? Of course. Did it matter in the end? Not one bit. No one is standing at the terminus, counting all of the calories you wasted carrying extra stuff. 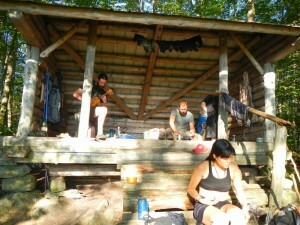 There’s no thru-hiker report card being filled out. Either you make it or you don’t. If the things in your bag helped you make it, then they were useful whatever they were. Let’s step back for a moment: What do I mean by safety? Safety on a thru-hike for me means successfully hiking from town to town and eventually reaching the terminus without grievous injury to yourself or anyone around you. This does not entail carting around a 3 lb. first aid kit that you don’t even know how to utilize to its full extent. This does not mean bringing a gun. This does mean, however, choosing socks and footwear that do not cause blistering, loss of toenails, or nerve damage to your feet. 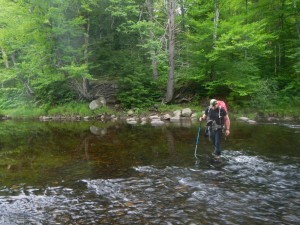 It means having appropriate layers of clothing to deal with the rapidly changing temperatures on a long distance hike. It means having shelter from the elements when you get caught out in them. It means having a sleep system that allows you to truly rest at night and regain your strength for the next day. It means carrying enough calories to see you through to the next resupply and/or buffet. And it means having water purification so you don’t poop yourself off the trail. The point I want to make is that if you’re not going to be happy at times, it shouldn’t be because of your gear. If you’re going to be sad, angry, or f rustrated, it should be because of some existential longing within your soul or some jerk you met, not because your pack doesn’t fit correctly (because you bought it off the internet without thought to torso size or load capacity.) I’m not a psychoanalyst, but I can fit a pack to your back with precision. There are few problems with gear that can’t be fixed. 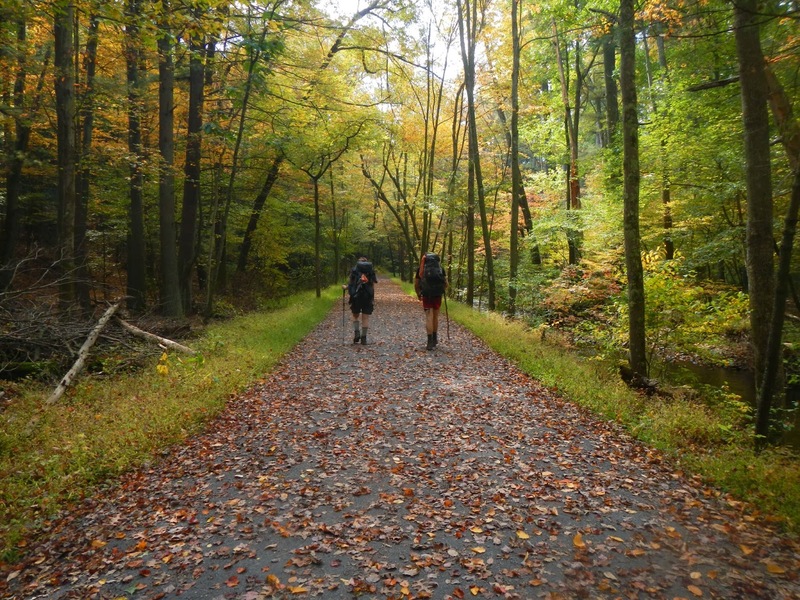 Remember that hike you’re going to do with all of your gear before you head out on the AT? That would be the time to figure out what hurts and why. And to fix it. Why? Well, the short answer is that I’m an avid reader and collector of books. It is part of who I am and, without this aspect of my life, I feel less connected to myself and what I’m doing on this Earth. I don’t like reading; I love reading. My vision of hell is a waiting room with nothing to read. And my vision of heaven? To be in the woods, miles away from civilization, with a book in my hand as the sun goes down. It is as simple as that. I made the decision to carry the extra weight so that, in the rare moments that I wasn’t hiking, eating, or sleeping, I could wind down and do a bit of what makes me happy no matter where I am. And I brought this particular favorite book as a symbolic boon for my hike. There are lighter, more weather resistant, more practical items that I could have brought to keep me busy when not moving, but that was not the point. Carrying this book made me happy, so I carried it. Don’t let other people dictate what keeps you smiling. That doesn’t work. You won’t look at any AT pack list that includes Giant Pretentious Modernist Novel, but that doesn’t mean you can’t bring one. Being safe and happy isn’t what hiking is all about. If these were your only goals, you might as well stay at home. Hiking isn’t always safe. 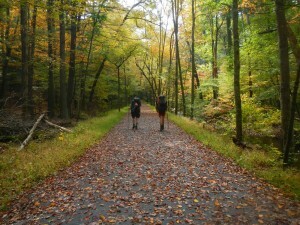 Being in the woods can be dangerous and there are certainly a lot of things you can do to minimize the risk, but at the end of the day a bit of the Fear is part of the experience of hiking. As for happiness, I don’t think I need to repeat that this is a conditional state that you will move in and out of on the trail just as you do at home or any other place that you happen to be. What hiking is all about is movement. You’re not a hiker when you’re sitting around town. 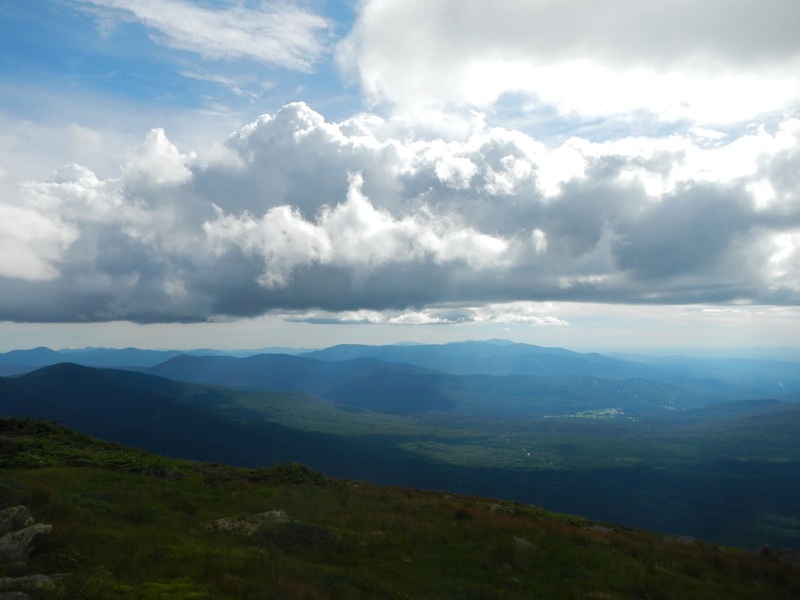 You’re not a hiker before or after your trip. You are only a hiker when you’re on the trail, making miles, and putting another footstep towards your goal. The gear you take with you should help with your progress, not hinder it. This is where your pack weight comes in. It’s trendy these days to try to go as “ultralight” as possible. There’s good reason for this: the less weight in your pack, the less strain on your body, the more miles you can potentially do on the same amount of calories. Makes sense, right? Yes, it does, unless you are going so “ultralight” that you are sacrificing your safety or your happiness (see above.) There is a balance to be met, just as in all things. So the point is to keep moving. No one knows what keeps you moving better than yourself, but there are a few universals. If you are injured, you will have to stop and rest. Your gear should not be the cause of injury (once again: shakedown hike! Please, for the love of all that is good in this world, shakedown hike!) If you don’t have the gear to move through and survive inclement weather, you will have to hole up in town. If you underestimate the amount of calories to pack out, you will find yourself tired, grumpy, and disoriented on the trail. A light pack isn’t going to help with any of these. So, yes, please, think about the weight of your pack and make sure that it isn’t weighing you down unnecessarily, but cutting weight just to cut weight is foolish if you are sacrificing your safety or happiness. This is also the point where the longevity of your gear comes into play. Going into town is both fun and necessary at times, but going into a town you weren’t planning on going into in order to find a replacement for malfunctioning gear is a huge waste of time and energy. I realize that hikers are all about frugality, but there comes a point when it is more cost-effective to buy quality than to settle for something less that you will have to replace (possibly multiple times.) Case in point: I thought paying over $10 for a titanium long spoon was crazy when I could buy a cheap plastic spork that weighed less for a couple of bucks. And then I broke my plastic spork eating noodles. And then I broke my second plastic spork eating mashed potatoes and now I’m eating my dinner with filthy, burnt fingers for days before I can replace it with the spoon I originally snubbed as being too expensive. There are definitely things that you can go cheap on, but when it comes to gear that is keeping you on the trail, you’ll find that spending the extra dough to get gear that is proven to last and warrantied against damage will save you a lot of time, effort, and money in the long run. The spork is a silly example in that I didn’t need it to keep moving. Had I skimped on my footwear and socks, however, I would have been limping back into town. Had I skimped on my backpack, I could have found myself at war with what should have been my dearest asset, whether that meant the straps rubbing me raw or the pack becoming nonfunctional. Again, the goal is to keep moving. Keep this in mind when gathering your gear. Keep an eye on weight. Too heavy and you’ll be huffing and puffing every step. Too light and you might be sacrificing safety and happiness. No one can pack for you. There are hundreds of example pack lists available on the internet. Look at them, learn from them, but in the end, you will come up with your own system that works for you. In all of my years of hiking, I have never come upon another hiker that is carrying the exact set up as I am. Why is that? Am I wrong? Is she wrong? How about that guy over there? Find what works for you. Test it. Make sure it does what you need it to and that it will last. If you need advice, we at RRT are always here to help. In the end, no one else is going to hoist your pack and hit the trail for you. Call me Goatman. In 2013, I flew to Maine with a friend and a backpack to attempt a southbound thru-hike of the Appalachian Trail. 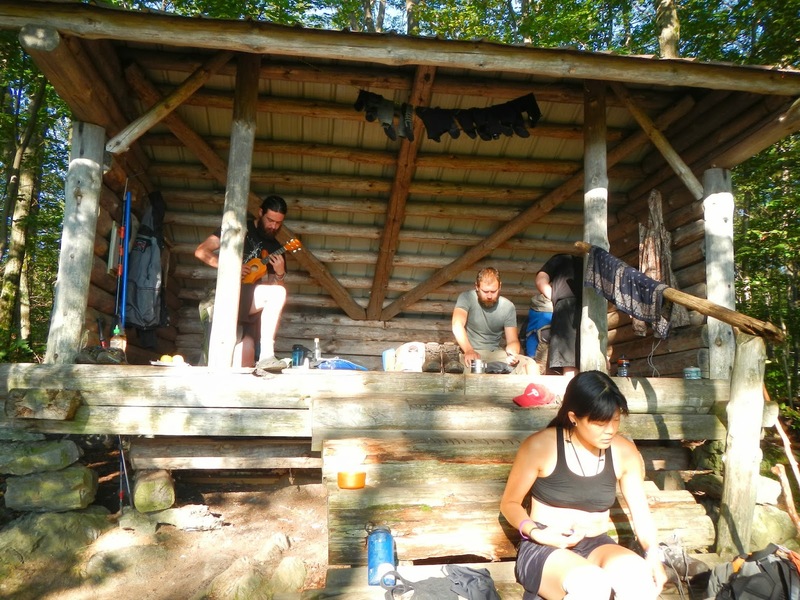 We walked for 4 months through the mountains and across rivers, hitchhiked into town for food, slept in the woods most nights, and were beholden to no schedule but our own. When we got to Virginia, we were told that Shenandoah National Park was closed due to a government shutdown and that hikers found within the park were to be fined hundreds of dollars and escorted out. We didn’t have hundreds of dollars. In fact, we barely had any money left at all. So we came home. Got jobs. Got soft. Became norms again. But the trail, she don’t stop calling. It’s 2016 and time for the Goat to return to the hills. And I want you along for the journey this time. The whole journey. And that journey doesn’t start when my bag is all packed up and I see my first white blaze on a tree in the distance. The journey starts now. 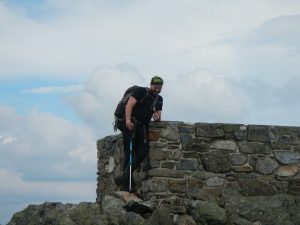 This blog series, Return of the SLOBO*, will be an inside look at how I, a thru-hike hopeful turned LASHer (Long A$$ Section Hiker) gears up and prepares for three more months on the AT. Each section of the blog series will have a unique focus, ending with actual trip reports from the trail as I hike it. 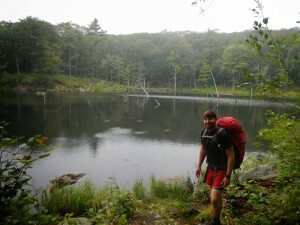 When I flew to Maine to begin this journey, I was green to backpacking. I had been out for a few nights here and there, but had never spent a significant time in the wilderness unsupported by modern convenience. I loved hiking, but who doesn’t love hiking when you have a warm bed waiting for you at the end of a couple of days roughing it? This time will be different. I have done my homework. I have lived the life and have been anointed with the sweaty sword of destiny and dubbed Hiker Trash Extraordinaire, Knight of the Dirt. For the past two years, I have also been working at Roads, Rivers and Trails, studying gear innovations, talking to other long distance hikers from all over, and even helping hopeful AT thru-hikers prepare for their time on the trail. I’ve come a long way, you could say, on the trail and off. In this blog, I will talk about training. I will talk about gear. I will talk about hopes and fears, food and sweat and feet and mud. Overall, I will talk about backpacking and the joy of hoofing it over hundreds of miles with everything you need on your back. The series will be broken down into sections. Links to other articles in the series will be added at the bottom of the articles as they are written. *An explanation of the term SLOBO: short for “slow south-bounder”. Even in the backwoods of Maine, one may not be able to avoid being categorized. My hiking partner, Jubilee, and I were known for three thing s at the start of our journey: “heavy” (40+ lb.) packs, sleeping until after sunrise (which was around 5 AM that far north in the summer), and taking afternoon swim breaks when we came to a beautiful lake. Such a lackadaisical attitude towards pushing miles was apparently frowned upon by other more Type A hikers. Fortunately for us, we found fellow souls on the same pace that shared a similar philosophy concerning long distance hiking (a shout out to Phoenix, Blue Tick, Ado, and the Bartender. SLOBOs for life!) 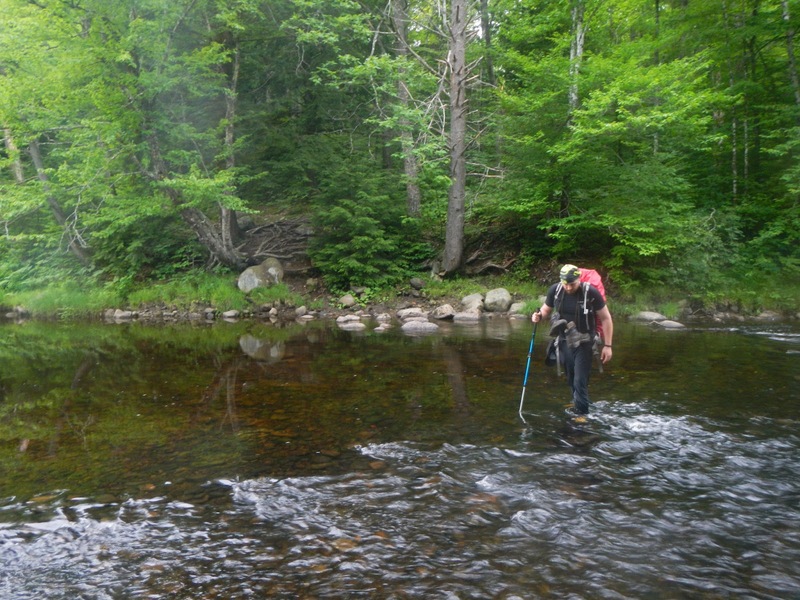 As it were, our packs got lighter, our legs got stronger, and we started to catch up to a lot of the hikers that had left us behind in Maine. I’m not sure who coined the term, but invariably we began to hear, “I never thought I’d see you SLOBOs again.” The name stuck, even when we started passing people who had burned out early. At this point, we’ve taken it as a name for our hiking tribe and proclaim it boldly, with honor.